Hello you. I'm a 38-year old MSc student, studying Advanced Computer Science at Sussex University. I'm especially interested in Internet and mobile software, sensors and pervasive computing, user interfaces, and the process of developing great software. Before that I spent 11 years running Future Platforms, a software company I co-founded which makes lovely things for mobile phones, and which I sold in 2011. I read a lot, write here, and practice Aikido and airsoft. I live in Brighton, a seaside town on the south coast of the UK, with two cats and a clown. Have you seen Green Goose? They're doing some beautiful stuff with sensors for consumers: turning everyday activities into games. I love the mundanity of it all: keeping the toilet seat up, brushing your teeth, walking the dog. One of their apps is called "BrushMonkey". It doesn't get any better than this. They've been around for a little while - there's a story on RWW about them from early 2010, but they seem to have changed tack since then, away from financial monitoring and towards fun'n'games. Here's an interview with their founder from December last year. Green Goose seem to be spreading themselves thinly across many applications: "We’ve got about 50 or so other sensors in development right now that we will fairly quickly release over time". Their hardware seems similar to Little Printer, in that they have their own gateway (the "station egg") which plugs into the spare port of a hub. 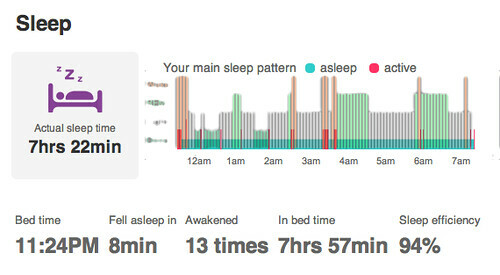 I've been following the Quantified Self for a little while now, ever since Colin Hayhurst first mentioned them to me; and Kate has a similar enthusiasm for the quantitative, so we've both been tracking aspects of ourselves: between us weight (Withings), diet (manually), sleep (Zeo), and exercise (Runkeeper, Fitbit). One of the modules of my Master's this year was Pervasive Computing, in which we spent a great deal of time looking at sensors and the real-world difficulties of extracting useful information from them. I did a project looking at LEDs, light sensors and morse code which I wrote about briefly here (and will post the full text of, once the course is over). 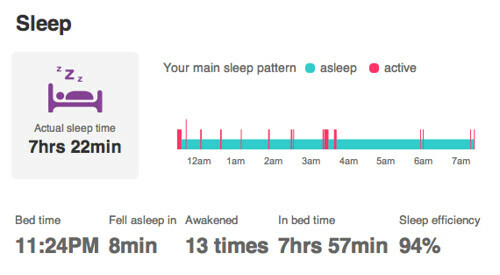 One key lesson from this was the difficulties of ensuring consistent useful results from different sensors; so when I noticed that Fitbit offers to track your sleep patterns, and Kate's Zeo did the same, I thought it'd be interesting to compare the results one gets from each. 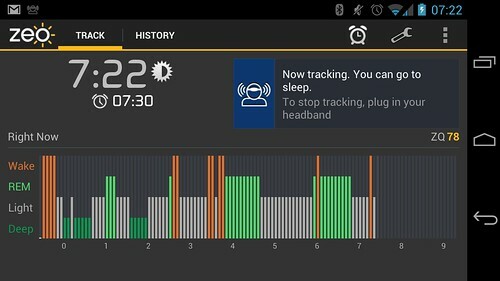 Fitbit straps to your wrist and detects hand movement, inferring sleep from a lack of such movement; Zeo monitors brain waves. The Guardian have released figures for their iPad product - 17,000 iPad subscriptions, an unspecified number of Kindle ones. I was trying to work out if this is good or bad. It's bad, because that's a small number (£2m gross revenue p.a. before Apple's cut). But with daily print sales of 211,511 in June, that makes iPad 7.5% of (print+iPad) readership. I wonder how that compares to the percentage of Guardian readers who own iPads... my gut would be plenty of room for growth. I'm curious about those Kindle figures, which would reach a different audience... and I wonder whether there's any plan for a paid-for Android product? Update: after a chat on Twitter with Benedict Evans: there are apparently 5.5m iPads in the UK, so iPad ownership here is 10%; not all those iPad subscribers are UK, of course, but it's a useful comparison. Not sure if we could conclude that iPad ownership in Guardian readers accords with that though, according to their own stats on readership their audience is roughly average in terms of age and gender, but skews towards being better educated and more likely to be AB than most. Accordingly I'd expect iPad ownership to be way higher - double? - for them. iSuppli have reported on their teardown of the Nexus 7 - $152 BOM, if you hadn't seen it already. Interesting to see how the Kindle Fire BOM has dropped from $191 to $139.80, in the 10 months since it launched. I'm not from a hardware background, but do manufacturers generally launch with the intention of making low margin on early adopters and compensating for that with mass market take-up once prices are lower? If so, given the buzz around decent low-cost tablets, one could consider this low initial margin to be advertising. How long does a device like this continue to sell for - a year or more? If the Nexus 7 takes the same path, then even sales of the low-end version should be generating a reasonable profit in 6 months time, or leave room to drop the price further if Apple come in low with a rumoured/FUDding (delete as appropriate) smaller iPad. I also wonder what the "additional costs" iSuppli talk about would include - shipping, packaging (or would the latter be "box contents")? A little package turned up in the post yesterday - the folks at Blackberry sent me a Playbook to have a little noodle with. Here are some observations from a preliminary noodling. I rather liked the size and shape. Unlike the Kindle and iPad, the primary orientation for the device seems to be landscape, not portrait. This works quite well; it was good for gaming and when held in two hands, my thumbs could reach pretty well anywhere on-screen. The edge around the screen is touch-sensitive, and the device uses this to have some nice "stroke onto the screen", "push off the screen" interactions. I think RIM may have missed a trick by not making more of these; one big problem with touchscreen UI is that parts of the screen are hidden by your hands. Making more of touch-sensitive areas to the side, or above and below, would allow for perfect selection of specific areas on screen, or easier scrolling actions that don't obscure any pixels. The device is weighted well (it feels balanced) and the back is made of a durable-feeling rubber. Overall it gives a sturdy sensation, unfortunately backed up by a slightly sluggish but reliable UI (I've yet to see a crash). Visually the UI feels weak: lots of dark colours (shades of blue) make some of the iconography less visible than it should be, and the screen is lower-than-retina resolution - so the pin-sharp clarity I'm increasingly used to just isn't there. Interaction-wise I felt it was a bit better; there's a nice UI to get across the idea of multitasking apps in the launcher, consistent ways to leave the app you're in and swap to another, good use of animation to emphasise changes in states of applications, and so forth. I think I'd put it ahead of iOS when it comes to app-swapping. However there were plenty of times in use when I felt I needed reassurance - totally blank screens whilst an app loads, or a spinner and no indication of how long I should wait. The email client and calendar are both pretty solid - not amazing, but sturdy-feeling. I've never used a "traditional" Blackberry email client so don't know how it compares. Setting up my GMail account was trivially easy. Bing Maps was, err, quite nice. Less featureful than Google but I like the aerial view with multiple angles, and the maps seemed readable. The browser works quite well: I gave a few of the Google web apps a go. Reader is usable, but the screen size means that tap targets frequently get muddled up, and I wasn't able to up the font size of the browser to compensate for this. App World seems to work OK; there's a reasonable catalogue of apps. Is it my imagination, or is there a tendency towards paid-for downloads on the Blackberry? Angry Birds for a fiver seemed unusually expensive. There's no Kindle app for the Blackberry. That's a massive loss - when I get a new device it's one of the first things I install. The idea of having a portable which I can't read my books on is a bit uncomfortable. I grabbed a free copy of a FPS game: a 400MB download which took some time even over wi-fi, but once downloaded it played well. The Playbook is a good size for a gaming device, fitting comfortably in two hands: I'm not a massive gamer, but I don't think the iPad is quite the right size and shape for that style of play. I visited app.ft.com and after seeing a loading screen, was redirected to a /playbook and a 404 page - looks like something at the FT end of things. One other nice touch: a "welcome" email from RIM with a few links to help, arriving a day after I set up the tablet. Very sweet. So this is what developing for Android looks like, eh? Well, it's not like that's anything new - here's the FP table-of-devices back in 2005, and I can assure you that between then and 2010 (when they were all stolen in a couple of burglaries) we ended up taking our selection to over 150. They all ran different operating systems and had radically different Java runtimes: different devices had different maximum sizes for their JAR files, screen sizes were all over the place, UI elements rendered differently, sometimes important APIs just wouldn't work (ISTR a missing implementation of available() on a Samsung device). I hope I'm not coming over all Four Yorkshiremen. I don't think many of us who worked through those days and learned how to ship products on a few hundred devices feel too nostalgic. My point is that even with the diversity of Android devices today, things are way better than they were: fragmentation can't be ignored, but you don't need to test on every conceivable combination of devices. Plus, not all fragmentation issues are down to the device. Here's an interesting piece from the CEO of Zipline making this point: "Yes, there were device differences but most of our problems were rooted in classic software engineering issues. We did see some crashes on specific devices, but the catalysts were devices that have less memory or run more processes which were causing the underlying issues to be exposed more often." And let's not forget the phenomenal growth in smartphone uptake since the days of J2ME, or the fact that Real People seem to use apps in ever-increasing numbers. The audience is larger nowadays; putting in less effort to reach a larger audience feels like progress to me. I can't help but notice that the developer TechCrunch interviewed for their story was quite accepting: "We like fragmentation as users prefer choice. We are not big believers that one size fits all". Why did they run a story complaining about the issues, based on a company who had no complaint? Via this New Scientist story ("Free apps eat up your phone battery just sending ads"), I came to the site of Abhinav Pathak, a PhDer at Purdue. He's been working on energy usage in mobile devices (a topic dear to my heart) building tools to measure the energy usage characteristics of Windows Mobile and Android devices, and thereby model the energy performance of apps. Very interesting stuff; I'd been looking for something similar last year without success. His 2011 paper presents the modelling side of things. He has two more recent papers listed on his site which don't seem available just yet, and Google Scholar fails to turn them up too. Looks like we'll have to wait until they're presented? Over the last few months I've been swapping between three mobiles: an iPhone 4, Samsung Galaxy S2, and Nokia Lumia. I've grown fond of each of them; like strangely ugly children, they are all special and I love them equally. Whilst the choice of apps of iPhone blows everything else away , there's something unpleasantly disjointed about moving between them. Maybe it's the zoom-in animations when launching an app, but every time I launch one I feel like I'm giving a particular product my full and exclusive attention, and must readjust myself to the whims of its particular interface. It's like each app is a little box of functionality, and I choose to move into and out of them in turn. This is most obvious when launching a site in Safari: I feel like I'm dropping whatever I was doing and trudging over to the web. In contrast, both WP7 and Android give the impression of moving between apps in a much more flowing fashion. In the case of WP7, maybe it's the left-to-right panning used across the OS: there's no animation indicating that "something else is starting now". In the case of Android, I suspect this is down to the componentisation that comes from breaking applications into Activities: you're not using an app so much as "doing something" (e.g. taking a photo). There are issues with this that annoy me, and I don't think that the design (in Gingerbread) delivers on the promise of this underlying structure. I'm still waiting for Samsung to mess up Ice Cream Sandwich for me; maybe once I have it, this is something I'll find is fixed or improved. The Lumia, btw, is a lovely piece of industrial design; the weighting and materials are perfect: extremely classy without aping the iPhone. It also gets some small things totally right: so brutalised am I by every other camera phone I've owned, I've still not managed to adjust to a world where I can take photos without unlocking the screen. From an industry perspective, the other nice thing about the Lumia is that it's a great product from a partnership of separate hardware and software companies: a nice reference for anyone who takes the view that you don't need to own the whole stack to make a great product. We had a big hoo-hah this week over O2 mis-sharing customer phone numbers. They've been sticking them in the HTTP headers for trusted partners for years (a few services FP built used them), but it looks like someone misconfigured a proxy and they leaked out on the wider web. They've been found, had a public slapping, and apologised. It's a shame, really, because identity is probably one of the last places where operators could really do something useful. They've long prided themselves on their ownership of relationships with their customers, and part of that relationship is their knowing who you are (more for monthly subscribers than PAYG, but still). I'm a bit puzzled as to why they haven't done more with this: one problem that the web has is a complete lack of innate sense of identity, which is why we all have to either remember lots of passwords, use software to manage different passwords for different sites, or have one password we use everywhere - and all of these situations are painful. I get that for many people and many situations, this anonymity is a feature not a bug, but I don't see why anonymity and convenience have to be mutually exclusive. Operators, of course, know who you are: it's not called a Subscriber Identity Module for nothing. And, just as they missed the boat with location services 5-7 years ago (by gathering useful location data and either refusing to release it, or trying to charge £0.10 per location lookup, ruling out some classes of application completely and making most of the others commercially unviable), they're probably doing, or have done, the same with identity. Imagine if when you bought your Orange phone, you could opt in to a service which identified you to web sites (Facebook, ebay, Google, Hotmail) automatically. Perhaps it could do this by presenting them with unique token, a bit like a cookie, which they could use to get your personal details from your operator (with your permission, of course). It'd be great for them (easier sign-ups and logins means more customers and more use), great for the end user (no passwords, hooray) and a decent proposition for the operator ("never forget a password with Orange"). If you're worried about security - well, you can lock your phone already and control physical access to it as well as you can your wallet. This needn't involve sharing your mobile number - the unique token could be a one-way hash of the number, or similar: something guaranteed to be you and only you, but of no value to spammers if they catch sight of it. As a customer you could control which web sites could use it, and which didn't. Parental controls could be used to restrict logins to specific web sites from the phones of children. It feels like this ought to be useful. There are privacy issues, true, but if you're using a mobile then you're already trusting an operator with your calling circle, communications, logs of text messages, web pages accessed… a whole pile of very private stuff. Is offering management of your identity on top of all this really a step too far?